Good question! It’s not the easiest one to explain because it’s different things to different people. In essence though it’s a form of sensory deprivation. Floatation attempts to take away as many of the bodies stimuli as possible to trigger you into a very deep state of relaxation. This is done by allowing you to float in a room with no light, no sound and where water and air are the same temperature as you. The floatating is made incredibly easy because we add huge quantities of Epsom salts (which have many additional health benefits) to the water. The salt adds weight to the water, increasing its density such that the water becomes much heavier than you... so you float rather than sink. In case you have ever been there: It's the same reason you float in the Dead Sea ðYOS but with Epsom’s salts instead of sea salt. Why Epsom salt rather than sea salt? Well becasue Epsom salts work best because there are many secondary health benefits to such a high Epsom salts exposure. Especially for those with joint pain or high stress levels meaning that sensory deprivation isn’t the only benefit of floatation. Is there anything else in the water? 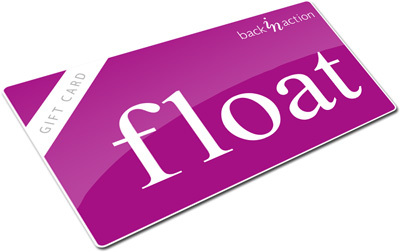 Here at Back in Action we believe that flotation is an excellent way to achieve deep relaxation, promoting stress relief and recovery from a variety of injuries. As well as assisting healing, promoting general well-being and self-improvement. Alternatively you can purchase gift vouchers online here today! All gift vouchers are dispatched by post within a few days.